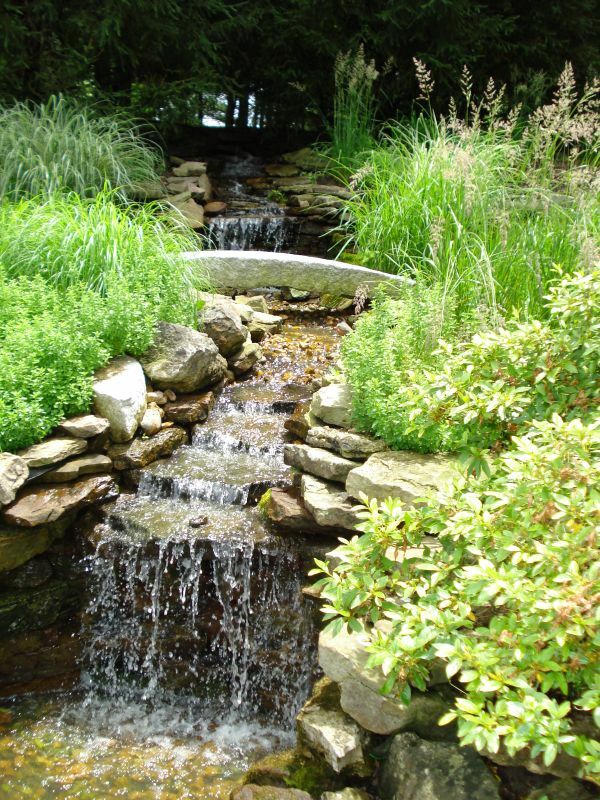 Chuck and Karen Lenz have an unusual bit of history in their water feature–a curved piece of granite curb from St. Louis city streets became their bridge. How did they get it? Their contractor could have the pieces if he would remove them from the city’s storage lot. – Equipment: 1/2 hp Tsurumi pump with a 2″ pipe and 72 gpm discharge, PFF 3000 Pondfiltration Inc. filter. – Special features: A granite bridge, three waterfalls, a Japanese lantern, seven Koi and one goldfish. When we re-landscaped, we replaced railroad ties with 90 tons of stone. The pond is one foot deep at the skimmer and two feet deep at the waterfalls. We would have made it deeper, but our back yard sits on a rock shelf. We made a mistake by not including a skimmer, so two years later, that was put in. 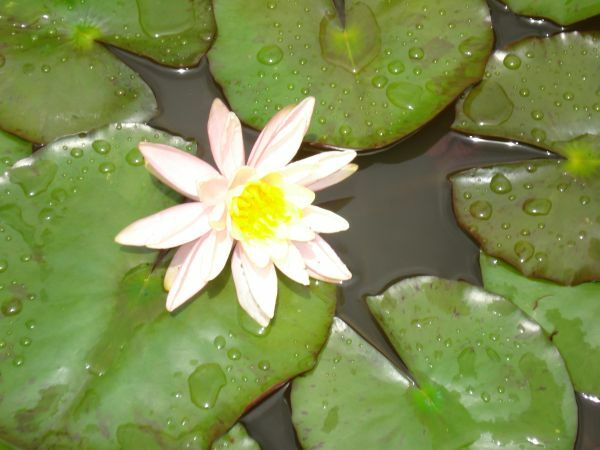 The reason we joined the St. Louis Water Gardening Society was because we had no idea of how to keep the water clear. Our kids had aquariums when they were young, but this was a whole new ball game. So we added a filter and started using Algaefix to control the algae. We’ve had issues with our fish. Twice, with neighbors watching the pond while we were on vacation, we lost all our fish due to the heat. The water didn’t have enough oxygen, even with the waterfalls! The two years that I didn’t cover the pond in the winter, I also lost all the fish to MINK. The little rascals come in and just clean you out, leaving no trace. Each time, Water Garden Society members came through and helped us get new fish. Now, with the help of Nies Landscaping, I seal the pond every winter with a net, bricks and big staples so they cannot get into the pond. Initially, we had ground cover on both sides of the pond which we have replaced with mulch. 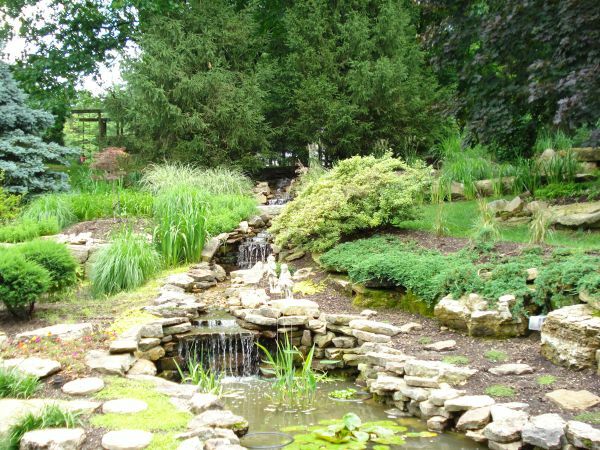 However, we have learned that: (1) run off from the mulch discolors the water, (2) mulch washes into the pond, and (3) mulch needs to be replaced all the time. Consequently, we are back to planting ground cover to slow the water run off, help filter the water and keep the dirt from washing down the slope. And one more story. Our golden retriever “Cameron” (named after Duke’s basketball court) is fascinated by the fish and constantly circles the pond to watch the fish move around. A couple of times his enthusiasm has prevented him from slowing down and he’s ended up in the pond, not able to get out because we have straight sides with no shelf. (Hang in there, Cameron! Chuck’s coming!) Wonderful experiences, Chuck! Thanks for sharing them.